This week our spotlight is on Sarah Ganaway from Oklahoma, USA. For starters, congratulations Sarah! 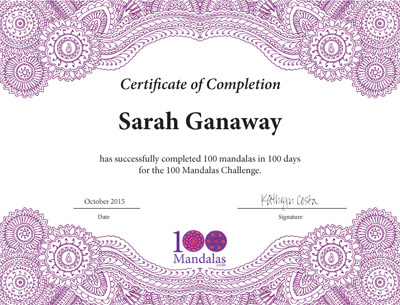 Sarah completed the challenge to create 100 Mandalas in 100 days. It takes persistence and dedication to reach a goal like this. Way to go mandala sister! 1. This mandala challenge has taught me that I can set a goal just for myself and/or my passion and make it happen even with my busy schedule! 3. The biggest challenge for me was forcing myself to stop everything that I do for everyone else and focus on myself for a few minutes a day. I always put myself last, I always make sure everyone else’s needs come first. I’m now learning to change that. 4. The best advice I can give anyone interested in this challenge is to go for it! Just dive in and make sure you set your goal for yourself. My goal was one small doodled mandala daily. I didn’t push myself to do large works of art. I set a goal for one small – focus on myself – forget all else – just doodle – completed – mandala daily. 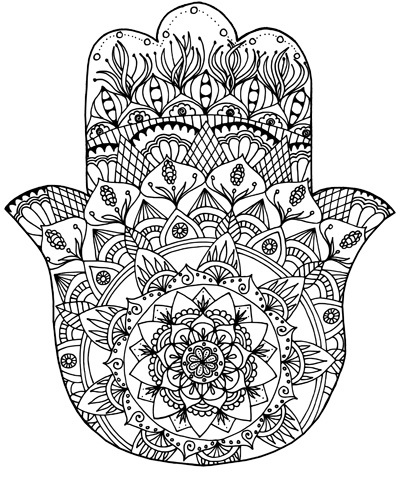 You’ll find Sarah’s artwork in the 100 Mandalas Hamsa Coloring Book. 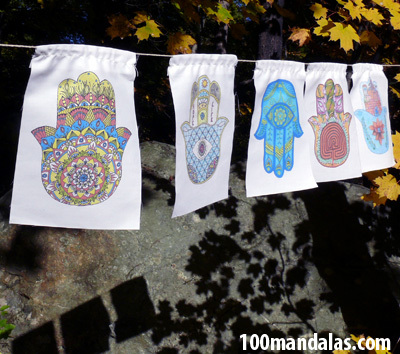 Her colored hamsa design was one of 10 images selected for the Hamsa Prayer Flag Peace Project. Thank you Sarah for your enthusiasm and many contributions to our community.